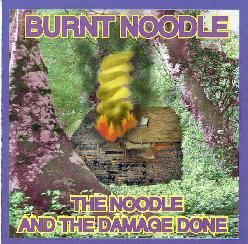 Burnt Noodle - "The Noodle And The Damage Done"
We reviewed Burnt Noodle's (formerly Noodle) demo cassette in AI #3. To celebrate the band's full length CD release I'm including a slightly revised version of that review in this issue. Based in California, the band is an improvizational jam rock ensemble with strong psychedelic roots and hints of space. The band consists of Paul Lamb on bass, synths, and vocals, Steve Sofranko on Hammond, piano, and mellotron, Tom Hardy on guitar, ebow, and vocals, Greg Haldan on guitar and vocals, and Rich Sherwood on drums. The music is played at a mostly easy going pace. Intensity builds at times, though even then the feeling is laid back. For example, on "We've Reached The Ocean" we hear a slowly tripping guitar and vocals whispering, "We've reached the Ohhhhh'-cean". "Fall Song" is a vocal number that sounds like a folk-psych Jefferson Airplane meets CSN. "We Need To Talk" is a funky soul piece that stands a bit apart from the other tracks with it's eerie ooh-wee-ooh synth lines and a "sort of" rap over the top. Interesting. It also has some tasteful blues guitar soloing. "First Rain is a short floating bluesy number that leads nicely into "Thin Air", an eight minute stoned out, spacey jam rocker that was a nice surprise as I don't think this was on the demo. And "Don't Look Down" has a driving Allman Brothers feel to it with pulsating organ and gorgeous guitar playing. "The Deep End/Attention Residents" and "Noodle In A Nutshell" are the two extended jams on the CD. "The Deep End" is a clearly Zappa influenced tune that begins with two guitars playing slow spacey solos against each other and what sounds like Zappa himself orating. The intensity builds and recedes and the guitars begin to duel with one another in a freaked out psych frenzy. In fact, since first reviewing the demo I've decided this is the strongest track on the disc (or at least my own favorite). "Nutshell" is a 22 minute epic that starts off as an easy going trippy jam with the intensity building slowly and subtly. There are some cool wah-wah psych guitar solos, some getting into laid back Hendrix territory, as the rhythm section continues to pick up the pace. The music jams along and we are treated to a variety of guitar sounds, and synths are introduced to produce some great space-psych jamming. Burnt Noodle is clearly a band that communicates well among themselves and it's important to keep in mind that nearly all the music on this disc was improvised. For more information click here to email Burnt Noodle.